Good Morning! What happened while you were snoring? (You were.) 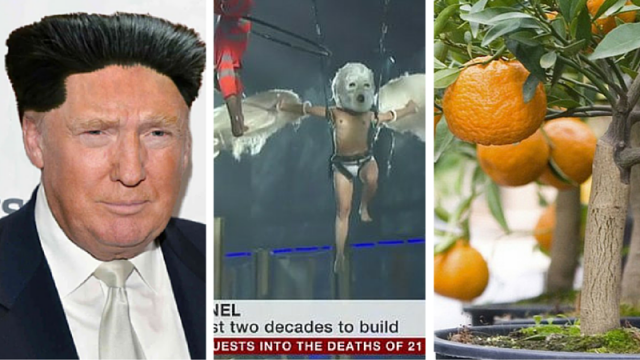 Well, Trump brought the world closer to peace, Queensland won Oranges and the Swiss got weird. Trump considered a “rad dude” by state-run North Korean media, the world awkwardly nods. In certain circles of the world, namely the mystical grey kingdom of North Korea, Donald Trump is seen as a “wise politician”. And that’s not your average Hyun G Lee’s opinion, it’s official. Like officially official. State-run media official. Yes. The mental destroyer USS Cynicism has set sail from the port of your mind, but, think about it: if Trump was the POTUS, then two of the United States’ shirtier enemies, North Korea (old) and Russia (older), are already over at Trump Towers for borscht and cake. As far as catching the dove named World Peace goes, the hands on its virginal neck might be Donald Trump’s. Trump’s not crazy, you’re crazy. There’s a sentence I thought I’d never have to type. The Gotthard tunnel belongs to the extremely moderate Swiss. Now, for a country who loves neutrality as much as it loves humourless bankers, this is extremely out of character. It’s like your straight-laced aunty getting into the sherry at Chrimbo and you discover that she’s a weird duck, and you’re unable to stop her Scandinavian death metal karaoke. All you can do is sit and watch in horror. Anyhoo, after a decade of hard labour, those who build it decided on celebrating their achievement with a very efficient display of interpretive dance. And this, kids, is why you don’t work underground for ten years. At least the audience loved it. Queensland wins first bag of Oranges, goes 1-0 up in series. Ball is short of the line. Tackle complete.